This month Asilia opened their new flagship property, Jabali Ridge, in Ruaha National Park in Southern Tanzania. This follows the opening of Roho ya Selous in the neighbouring Selous Game Reserve in August. Asilia's investment in these new camps is part of a long term strategy to boost responsible tourism in Southern Tanzania and to make a meaningful contribution to local economic development and conservation efforts. Jabali Ridge is the most sophisticated property in Southern Tanzania. Perched on a kopije looking down over a forest of baobabs, the camp blends seamlessly into the rocks which cocoon it. Eight rooms can be either twins or doubles (with king size beds) and the walls are made entirely from louvred shutters to allow guests to feel as though they are living in the open air with uninterrupted views. Jutting from the rooms are vast baobab trunk like elements, a homage to the landscape beyond. The interiors are the epitomy of understated luxe, recycled railway sleepers were used to make the beds which are covered in hand dyed linens inspired by the muted tones of the surrounding rocks. 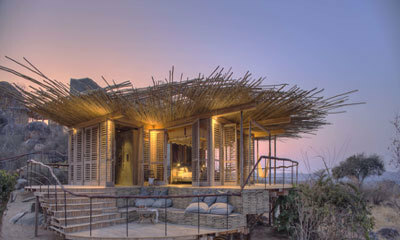 Designed by Caline Williams-Wynn of Cape Town based interior design firm Artichoke and Johannesburg based Nick Plewman Architects, the bold design and outstanding location are true to Asilia's ethos of pioneering safaris in areas which offer exceptional experiences whilst making a lasting positive impact. Jabali Ridge has a rim flow swimming pool for lazy afternoons, a spa for soothing massages and a dedicated library with an extensive selection of literature and fiction on southern Tanzania and beyond. Meals are fresh and light, in keeping with the hot climate and the speciality gin bar boasts spirits from around the world. Ruaha is Tanzania's largest national park but has just a handful of safari camps meaning that game drives from Jabali are uncrowded and other safari vehicles are a rare sighting. It is about the size of New Jersey and part of the larger, unfenced Ruaha-Rungwa eco-system which covers 50,000 square kilometres. This eco-system is home to strongholds of many of Africa's endangered species; considerable populations of lion and elephant roam here as well as less common species such as roan and sable. Explore on morning game drives, accompanied with breakfast in the bush, afternoon game drives with sundowner drinks, bush walks with our highly experienced guides and on night drives to see what comes alive after dark. The neighbouring Selous Game Reserve is the perfect compliment to Ruaha's flora and fauna. The Selous's lifeblood is the Rufiji River which meanders through the wilderness and opens up into vast, shallow lagoons which provide water to the reserve's inhabitants. Here the wilderness is best explored by boat. Guests can cruise gently and unobtruisvely past pods of hippo wallowing in the shallows and basking crocodiles on the shore. Set on a palm tree lined spit which juts out into Lake Nzerakera, Roho ya Selous is an eight tented camp surrounded by water. Seven tents can be either doubles (with king size beds) or twins and there is an additional, dedicated tent for families. Asilia's aim was to build a camp that not only provided guests with comfortable accommodation but also reflected the very essence of what Selous is all about – raw, wild and untamed Africa. The outside has been brought in wherever possible; subtle hues of blues, greens and greys combined with textured reed walls, stone floors and hand-woven grass carpets give the interiors a natural but modern feel and the outdoor shower means guests can feel the breeze as they shower under the African sky. As with all building projects Asilia undertakes, as much as possible has been sourced and made locally. The joy of a safari in the Selous is the variety of activities on offer. Unconstrained by the usual safari formula of morning and afternoon game drives; Roho ya Selous offers boat safaris, catch and release fishing, walking safaris, visits to historic World War One sites as well as the traditional game drive. The truly adventurous can spend a night fly camping in a dry riverbed far from the main camp with nothing but a gossamer layer between them and the African night sky. In tandem with these tourism developments Asilia will engage in various conservation initiatives in the Selous and Ruaha during the coming years. Already a long term partner of the of the Ruaha Carnivore Project which does exceptional work in reducing human wildlife conflict, Asilia is launching more community and conservation initiatives in 2017. “Our new camps in the Selous and Ruaha will not only allow us to offer our guests a great experience in these magnificent wilderness areas but also create a presence for us from which we will be able to make a meaningful impact on the conservation of these important eco-systems and the livelihoods and opportunities of the people surrounding it” says Jeroen Harderwijk, co-founder and Managing Director of Asilia. For more information, visit asiliaafrica.com.